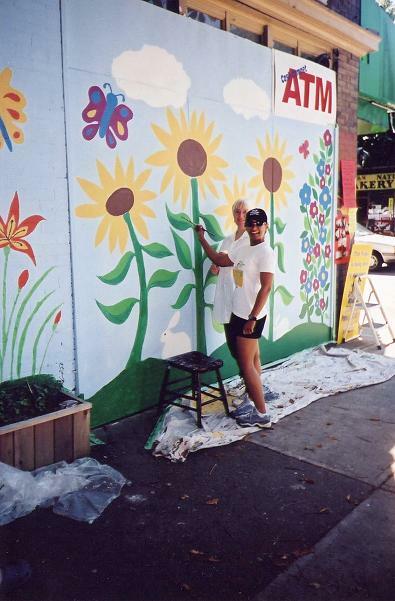 Eileen Mosca has never seen a wall she didn't want to paint. 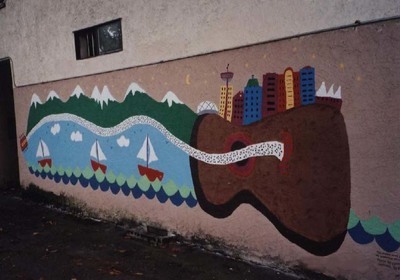 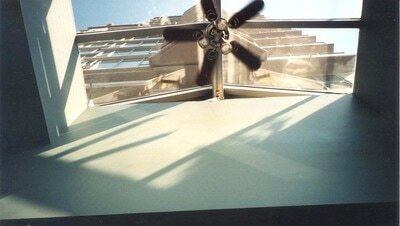 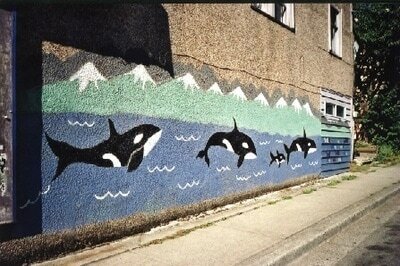 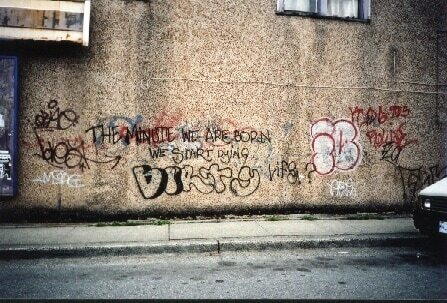 She has done murals in New York, Boston, and Jerusalem as well as in Vancouver and its suburbs. 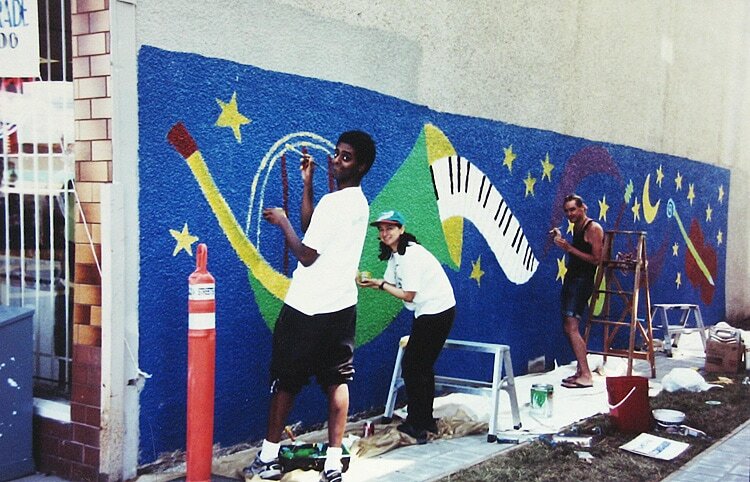 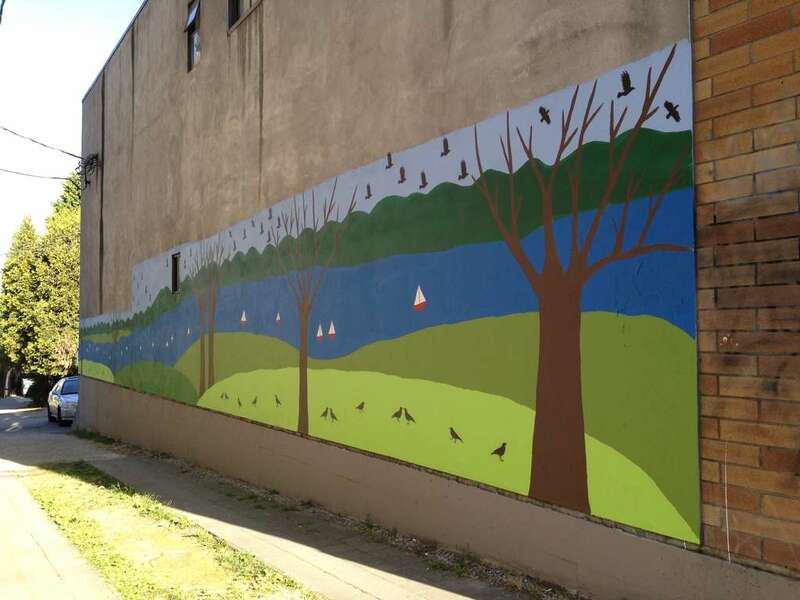 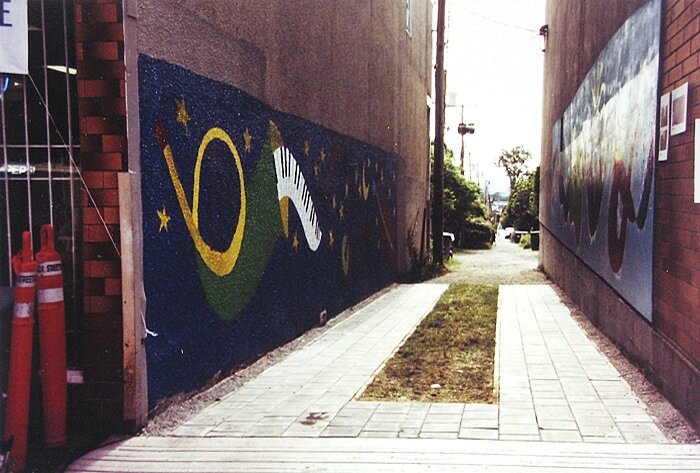 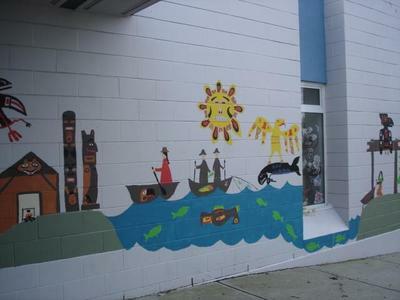 In addition to residential, institutional and commercial murals, she has worked with school children and community groups on large and small-scale mural projects. 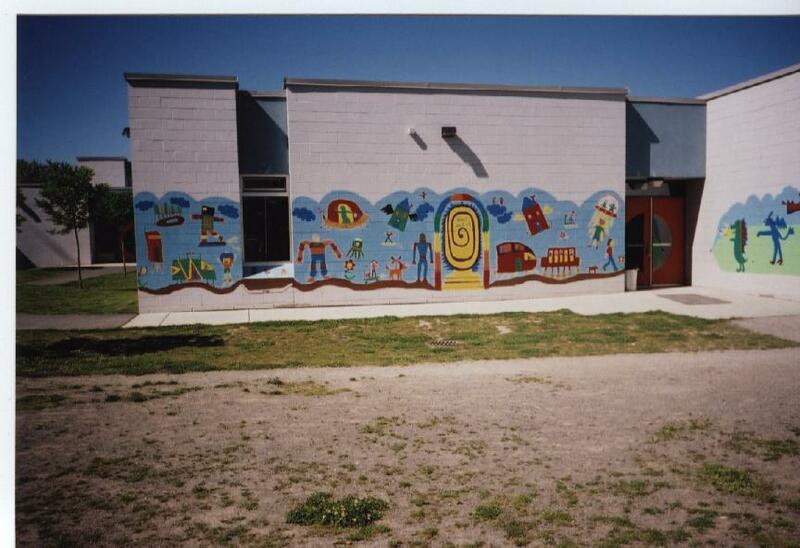 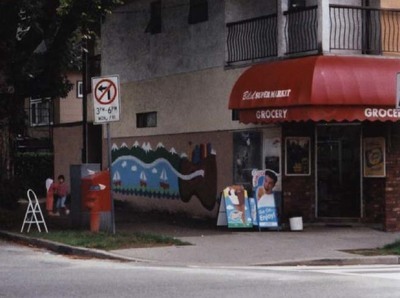 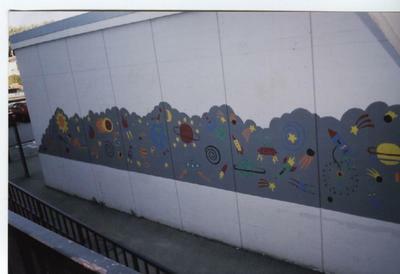 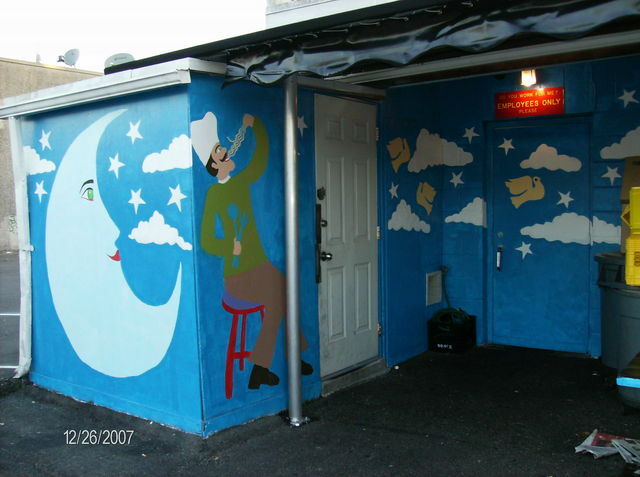 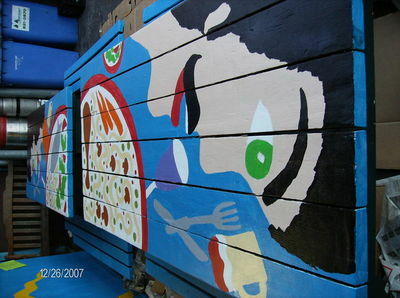 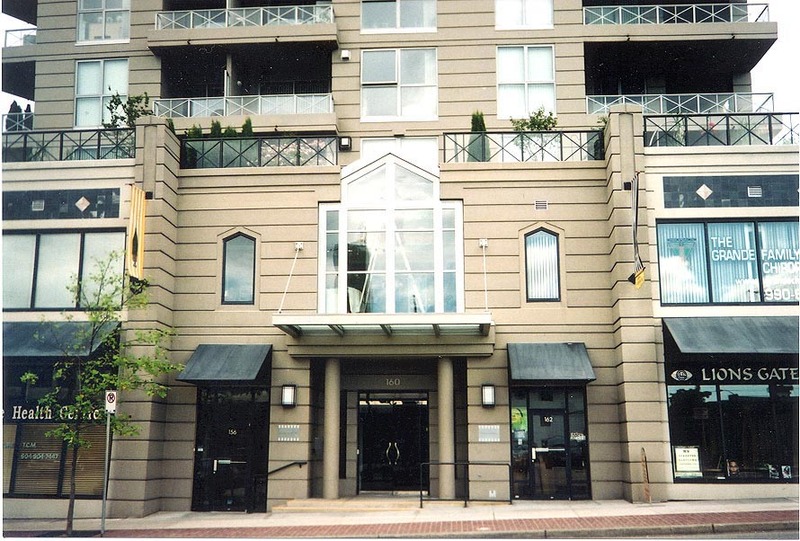 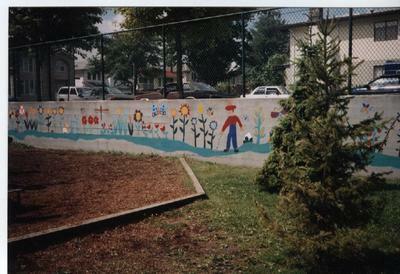 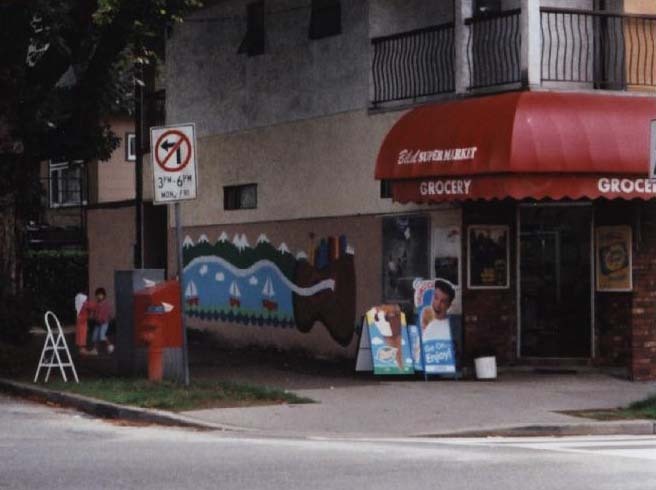 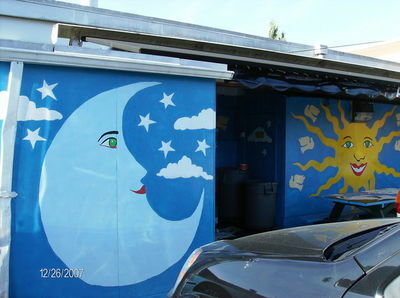 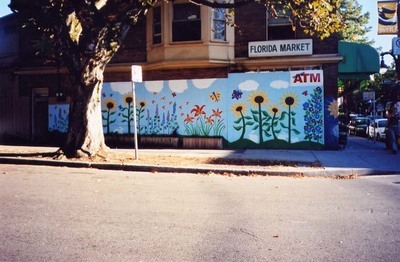 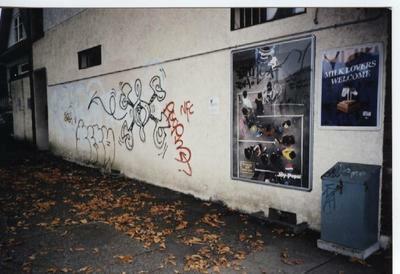 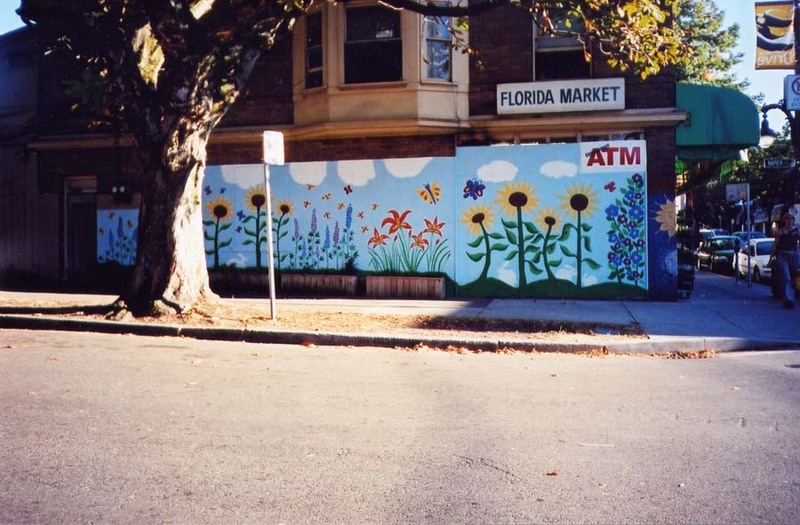 The Florida Market mural, shown above, was completed in July 2003. 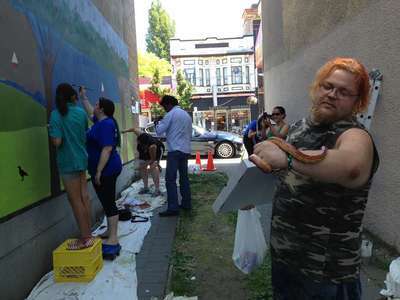 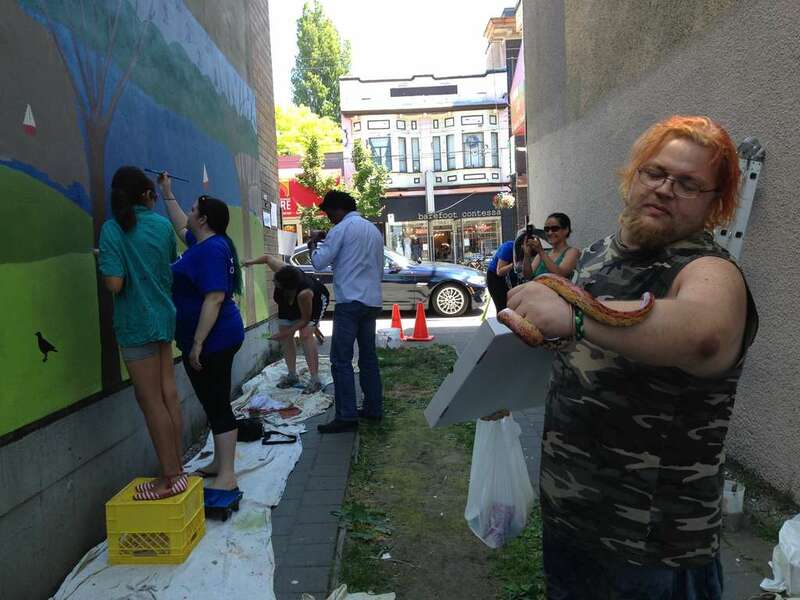 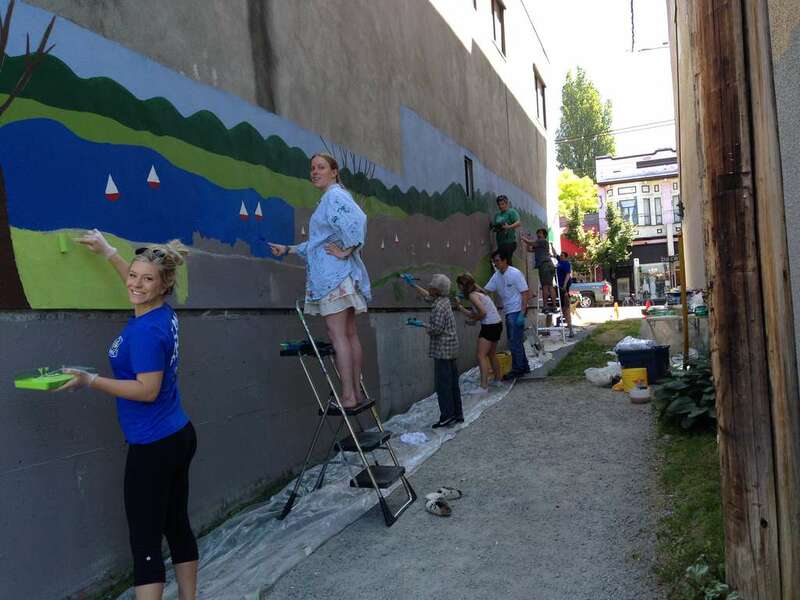 It involved over 30 community residents who participated in what was called "Vancouver's largest paint-by-number project." 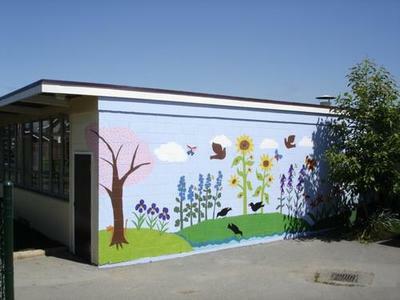 Every Spring since 1992, Eileen has worked as artist-in-residence in numerous Vancouver elementary schools. 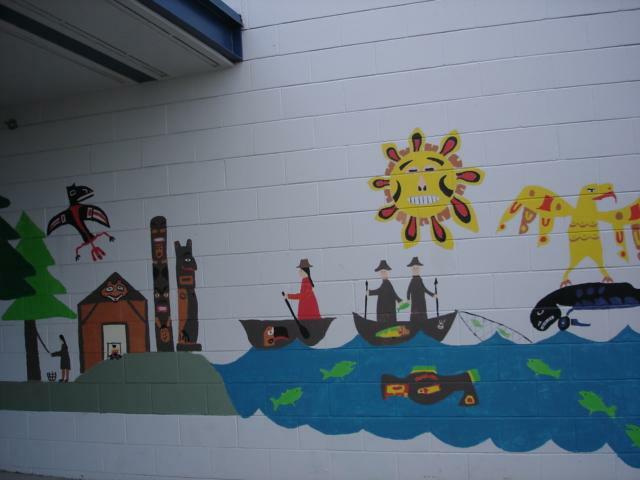 She has worked with grade 3 and 4 students at Garibaldi, Dickens, Mackenzie, Mt Pleasant, Tillicum False Creek, and other schools to create indoor and outdoor murals. 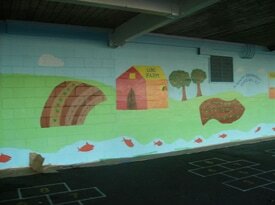 Every child in the selected grade participates in planning, discussing, designing and painting the mural with Eileen. 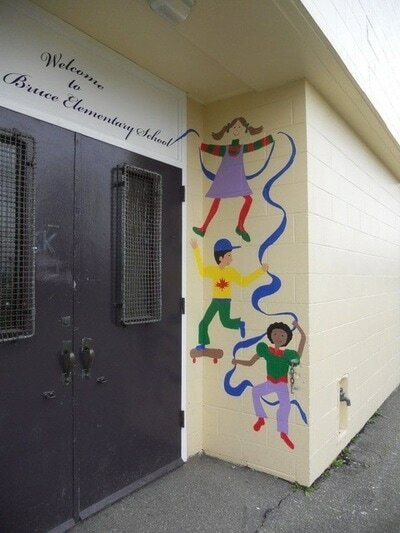 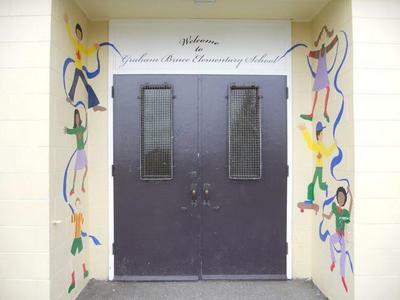 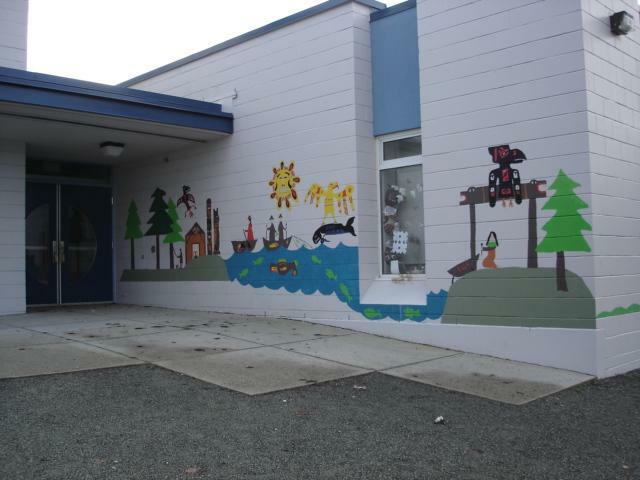 Eileen recently worked with grade 5 and 6 students at Graham Bruce Elementary School in Vancouver to create a mural based on a sustainable future. These classes have been connected to the UBC Farm program, and through gardening and field trips they are very familiar with environmental and local food initiatives. 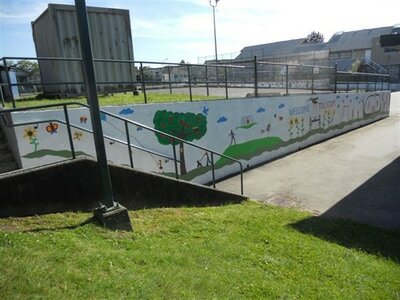 After spending time discussing and brainstorming the content of the mural with all 50 students, Eileen worked with a smaller group of kids to turn everyone's ideas and drawings into a mural design that expressed their views and hopes for a 'green future.' 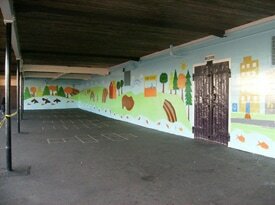 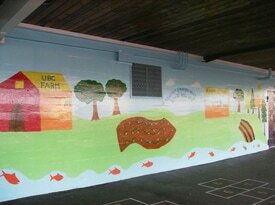 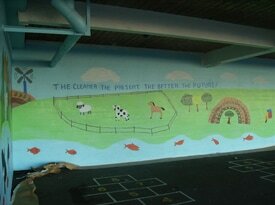 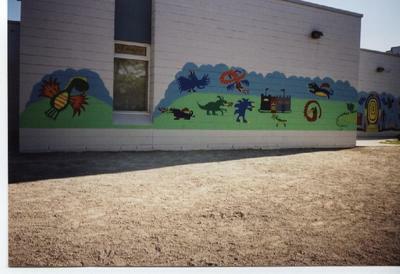 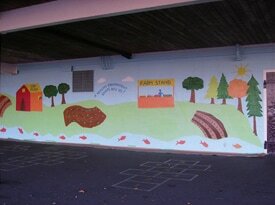 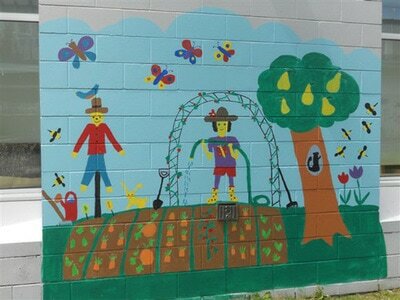 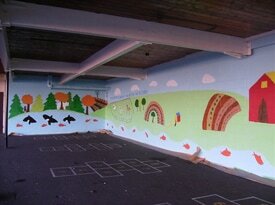 She outlined this on a 100 ft wall and then each child spent an hour or more painting the mural with Eileen's guidance. 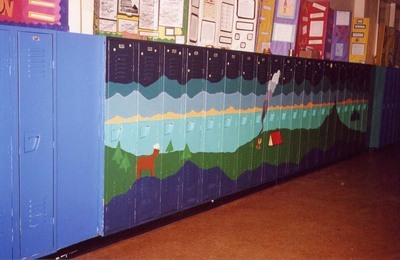 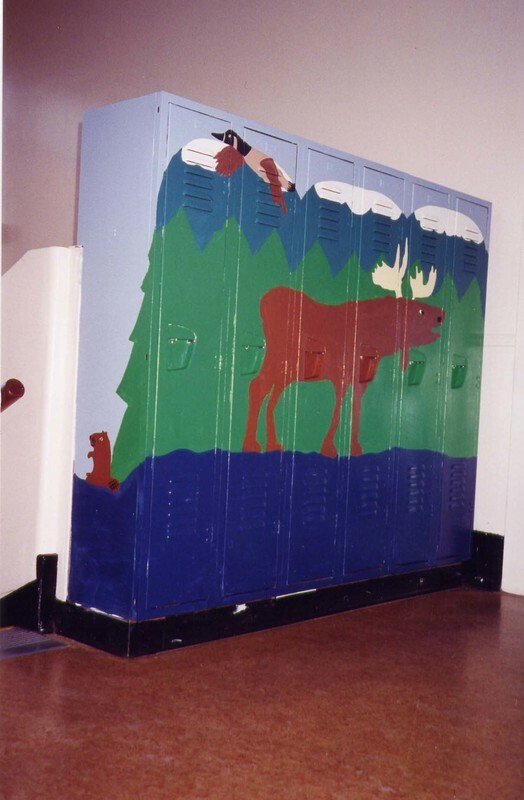 Eileen worked with students to paint the lockers of a Dickens Elementary hallway with scenes inspired by the students' love of the outdoors. 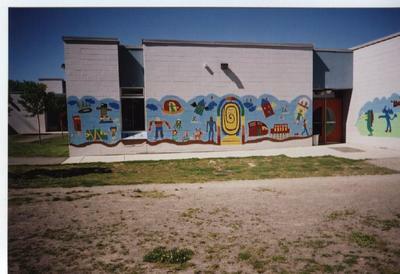 In collaboration with young students at Mackenzie Elementary, Eileen helped create murals all over the school and its grounds. The painted scenes include butterfly gardens, outer space, First Nations culture and of course, the school's mascot: Dragons! 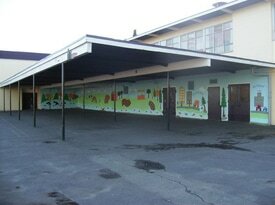 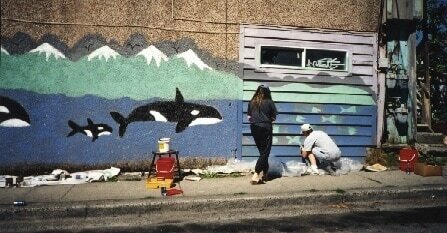 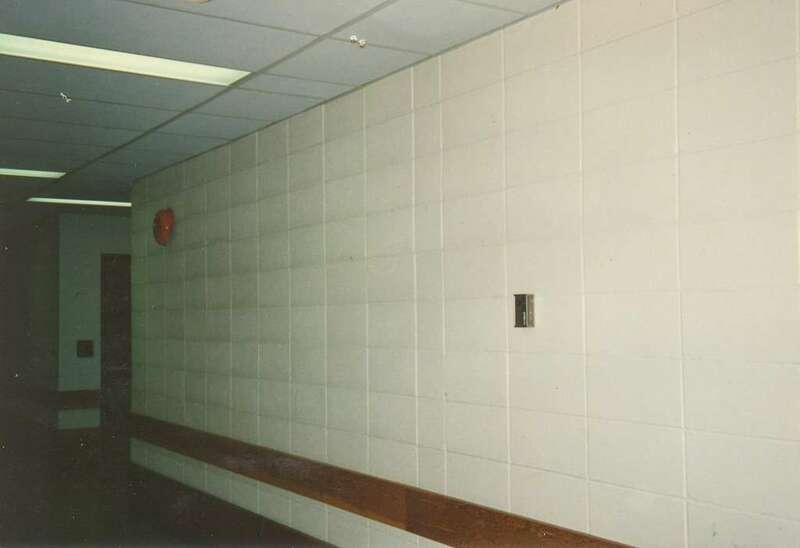 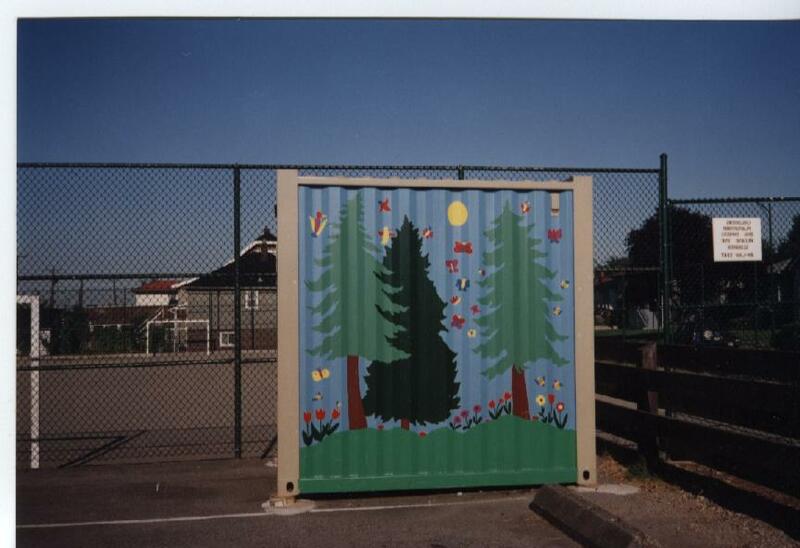 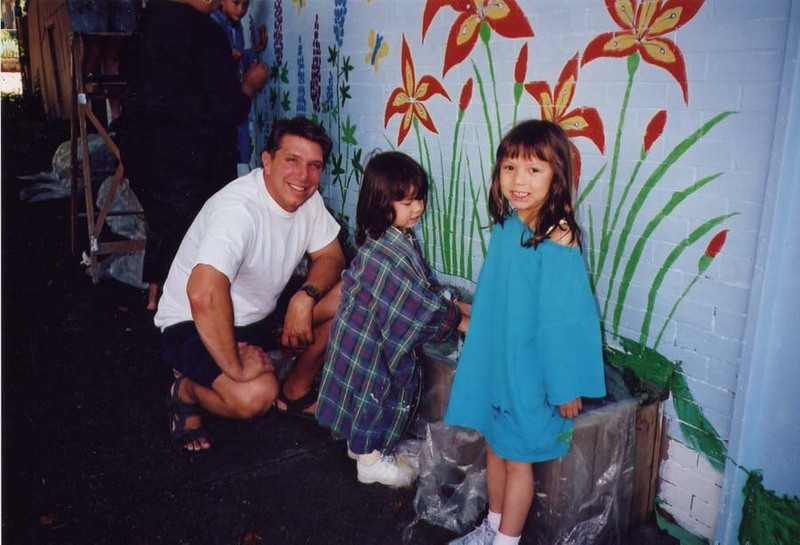 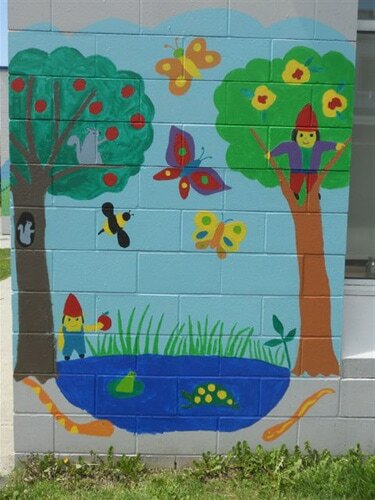 Eileen helped cover an unsightly earthquake box with a forest mural, and the hallways of the annex school were also brightened up with her art. 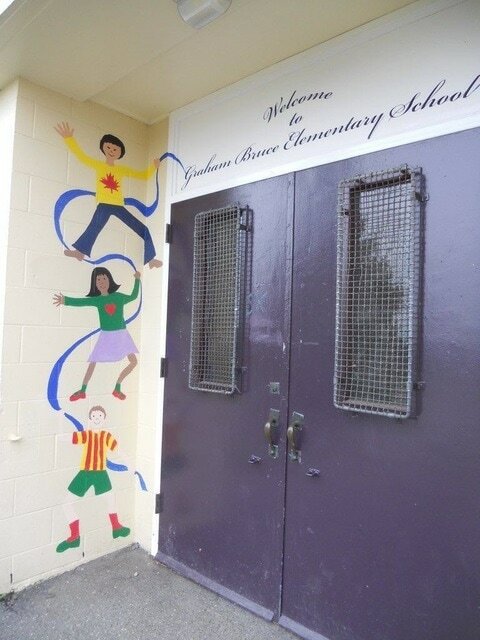 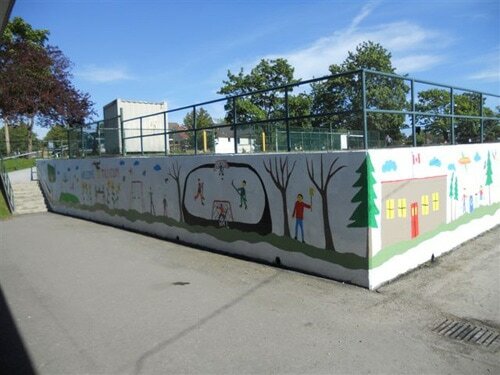 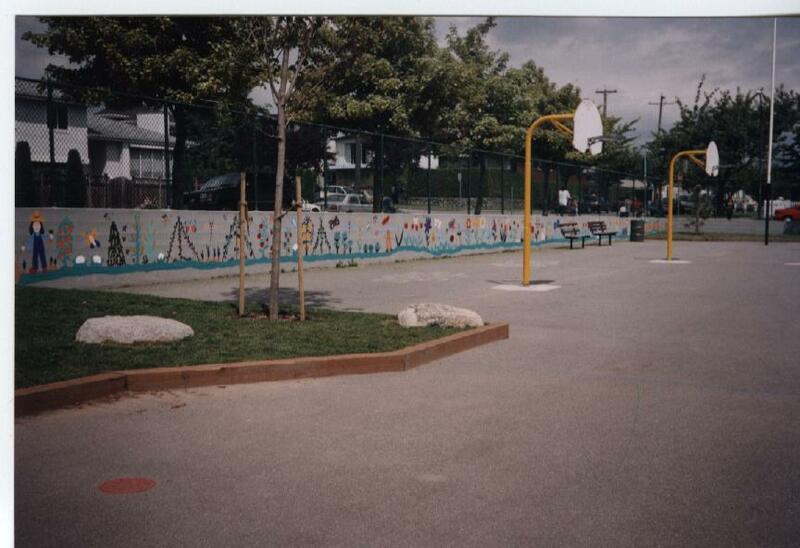 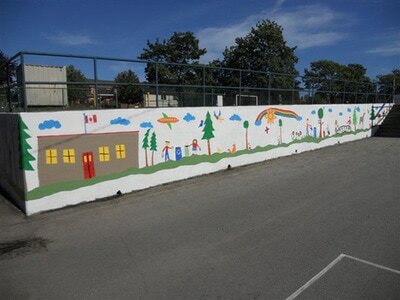 Eileen worked with grade 3 and 4 students from this small Vancouver school to liven up their outdoor play area with a mural that sends a message: "Welcome to Tillicum". 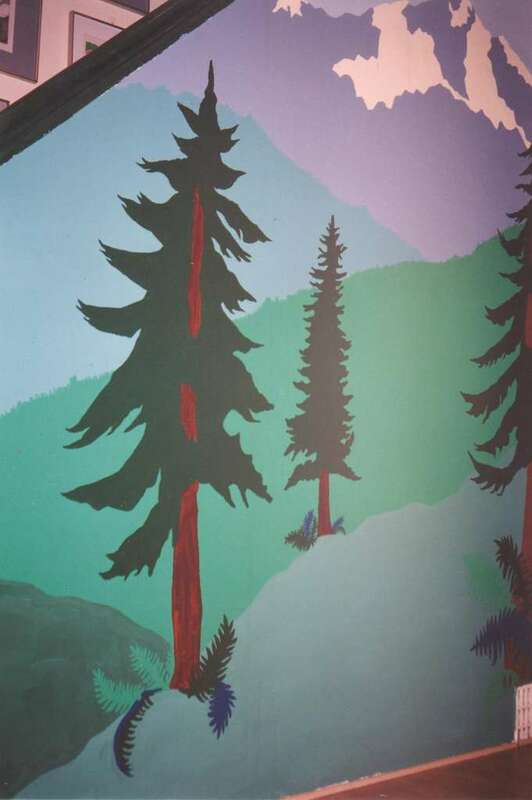 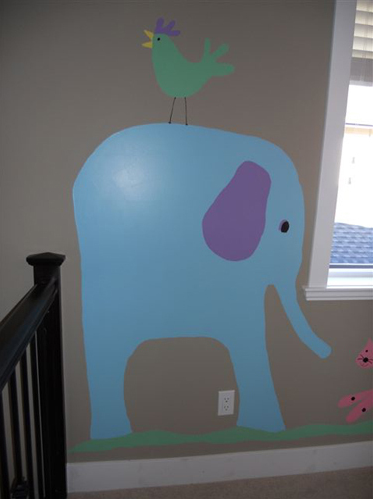 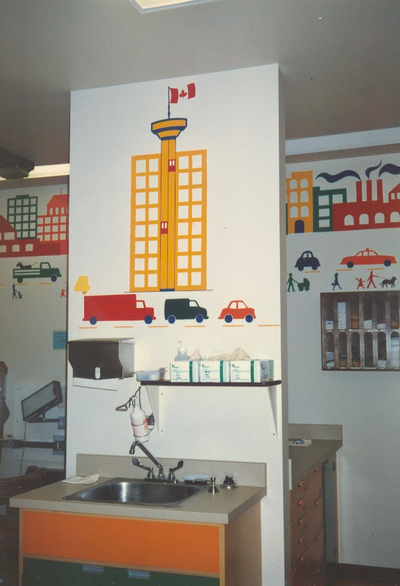 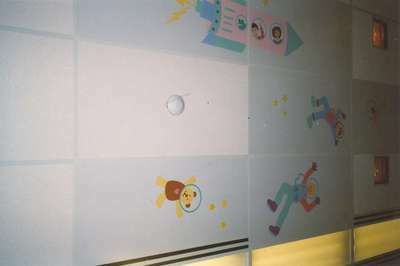 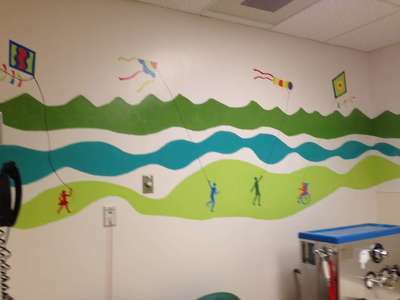 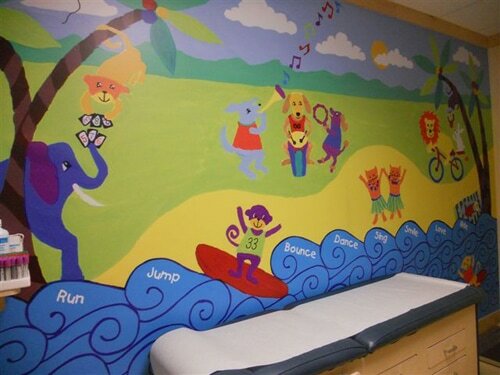 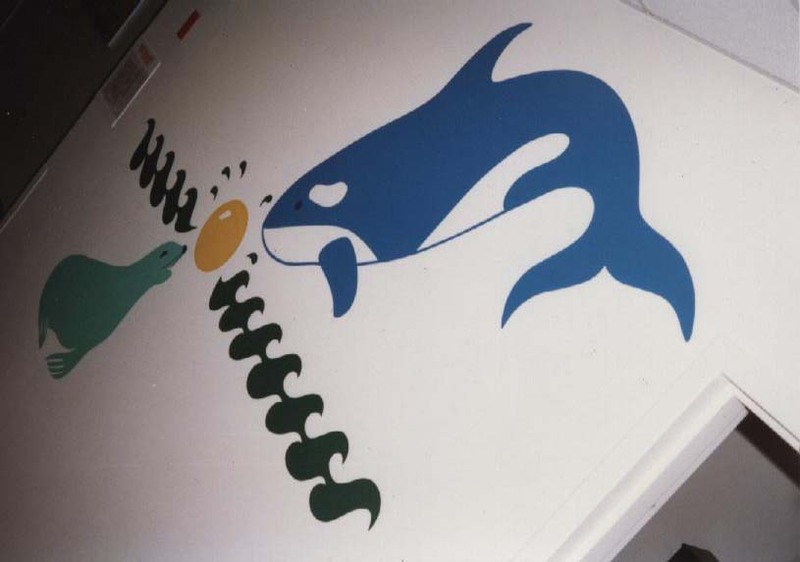 BC Children's Hospital, Sunnyhill Hospital and facilities in Surrey and Burnaby feature murals designed and painted by Eileen. 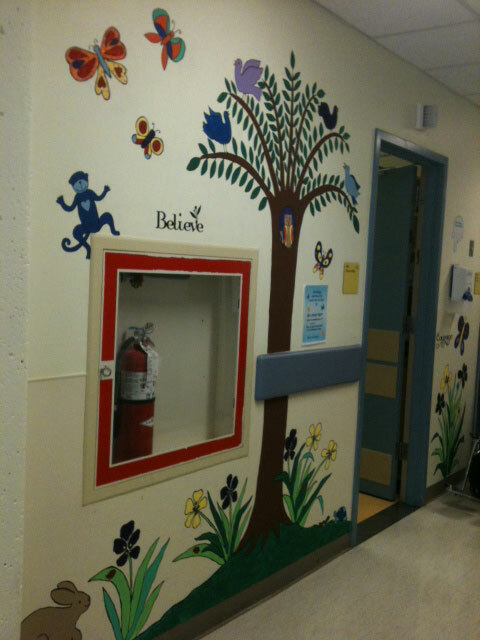 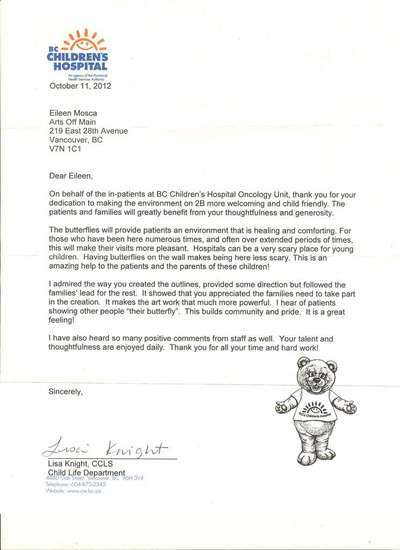 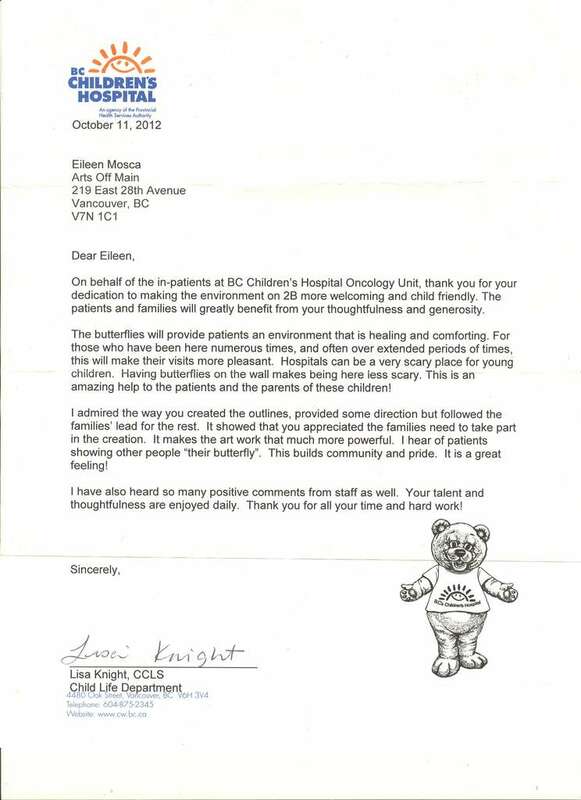 Eileen has had a longstanding friendship with BC Children's Hospital, and has painted many murals for them over the years. 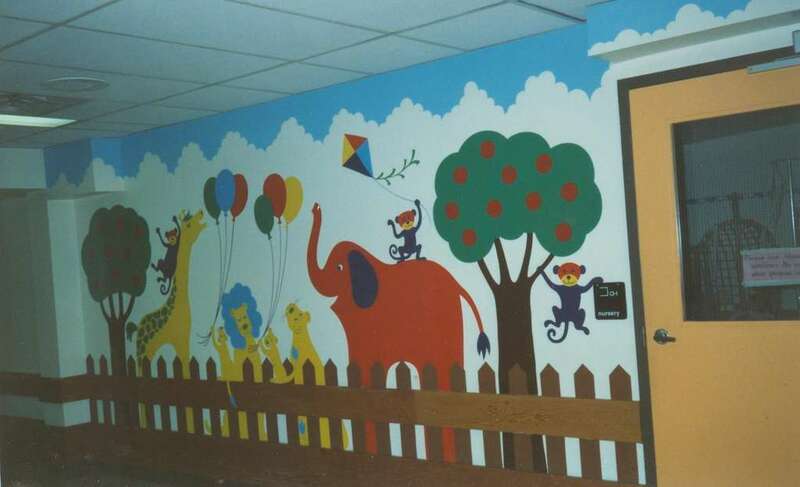 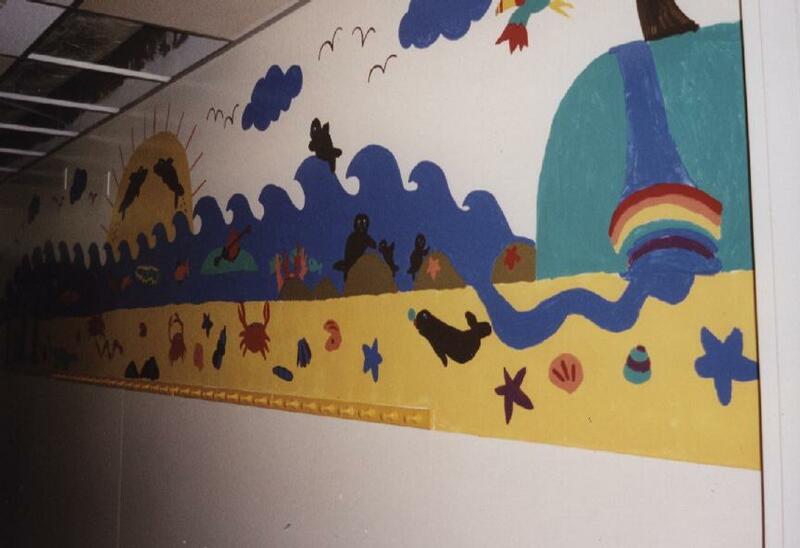 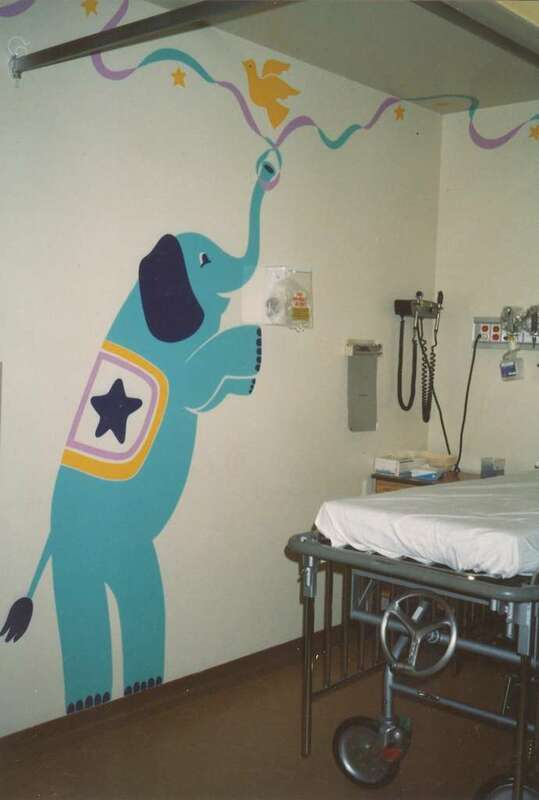 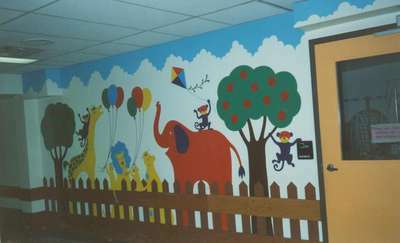 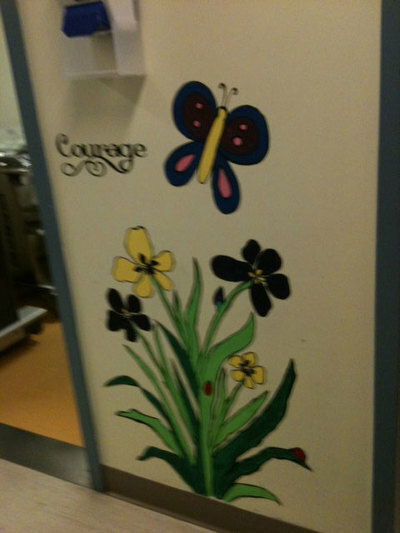 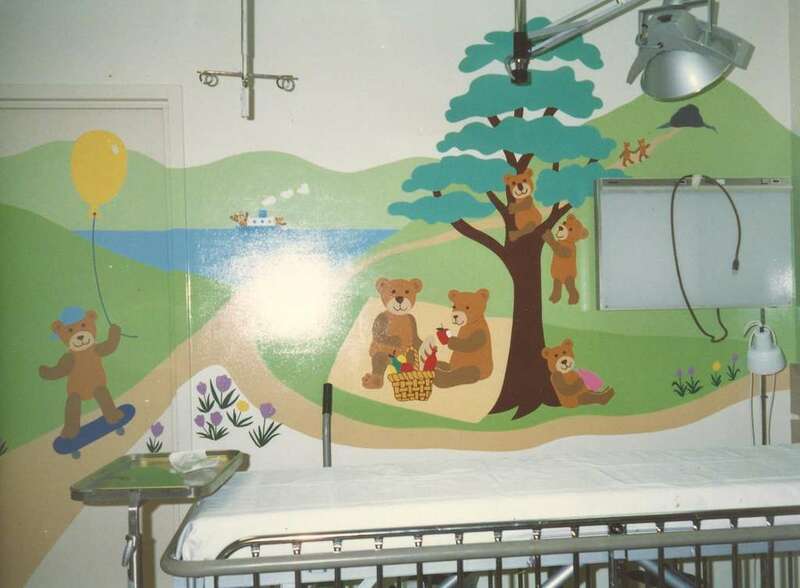 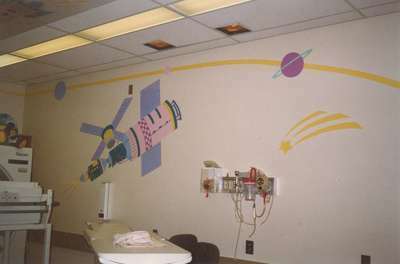 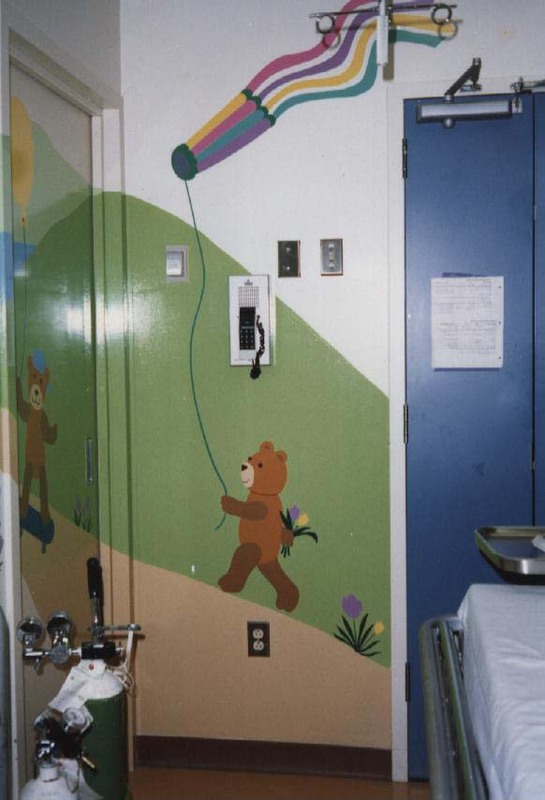 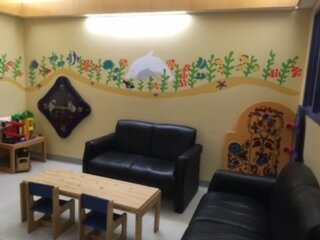 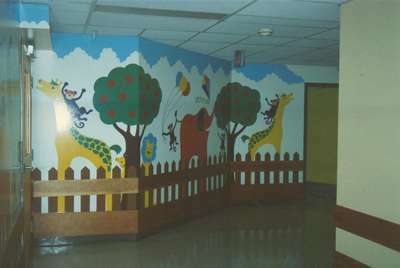 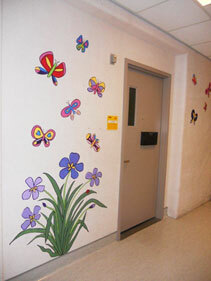 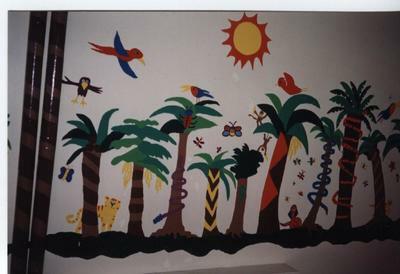 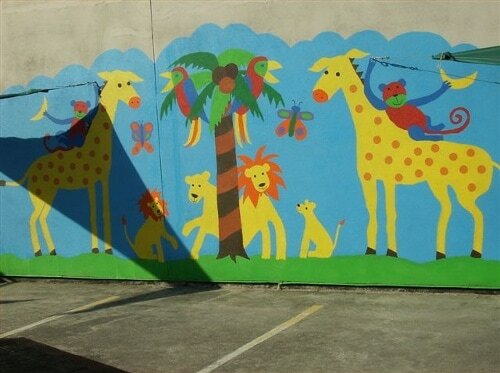 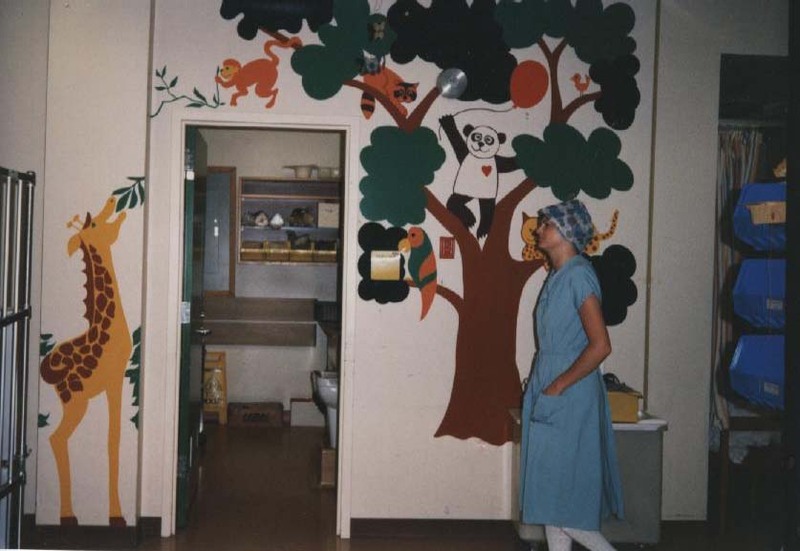 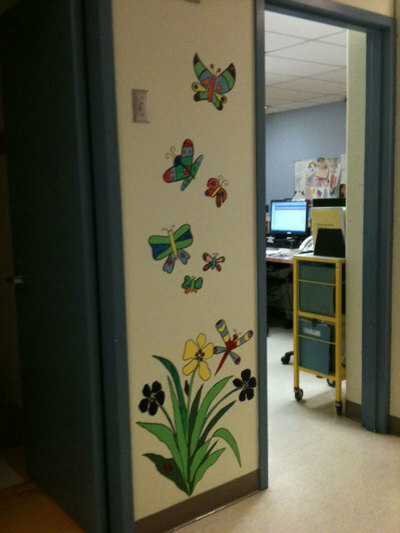 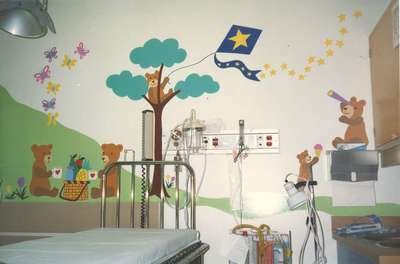 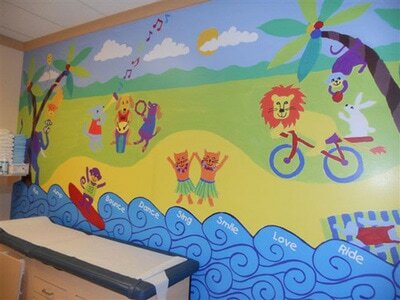 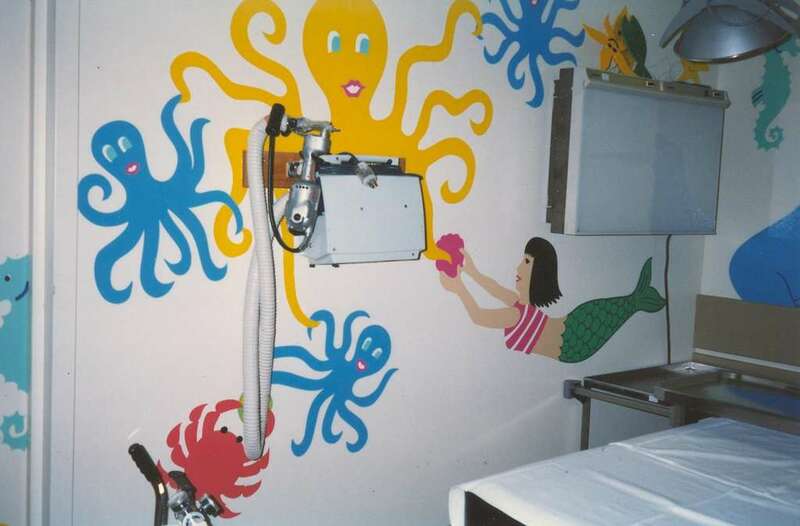 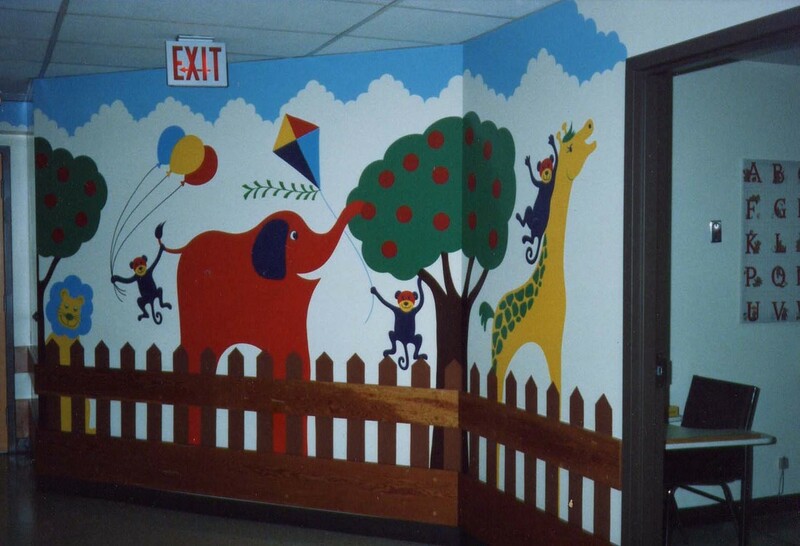 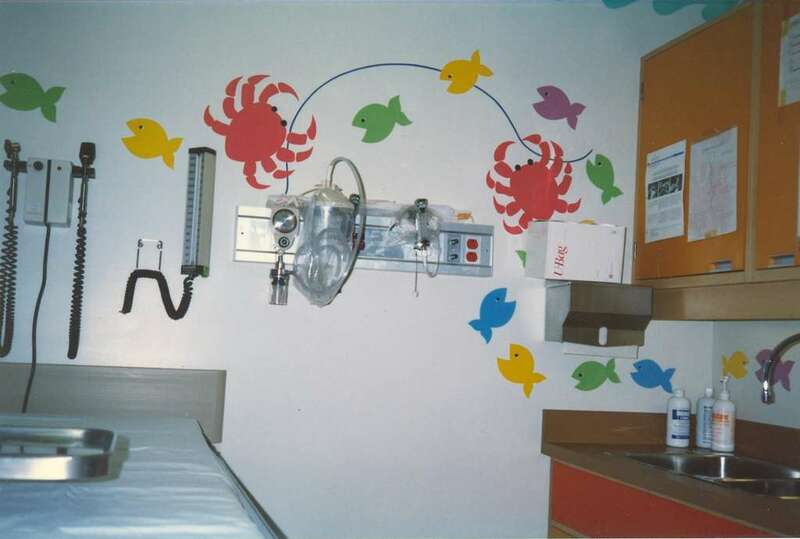 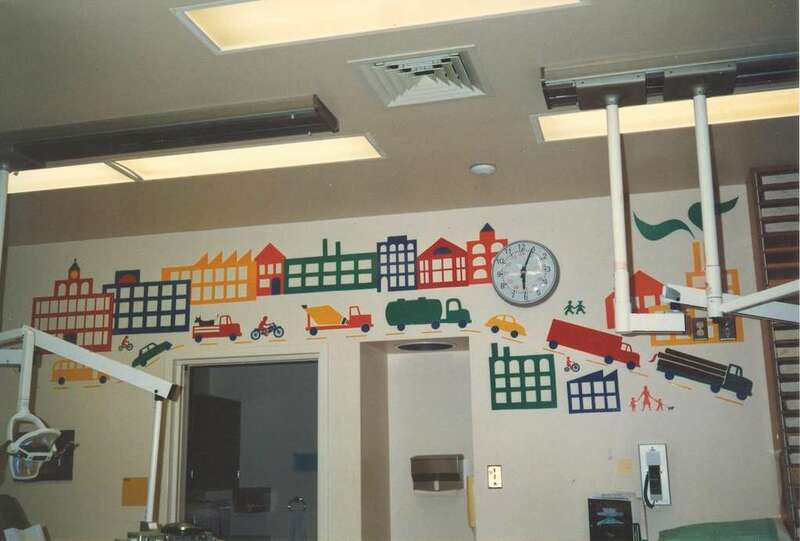 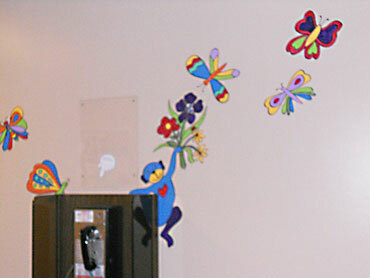 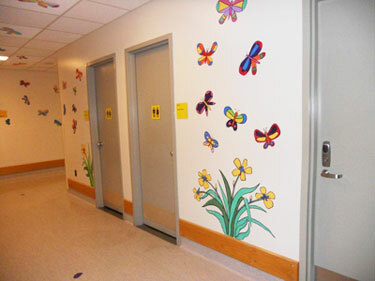 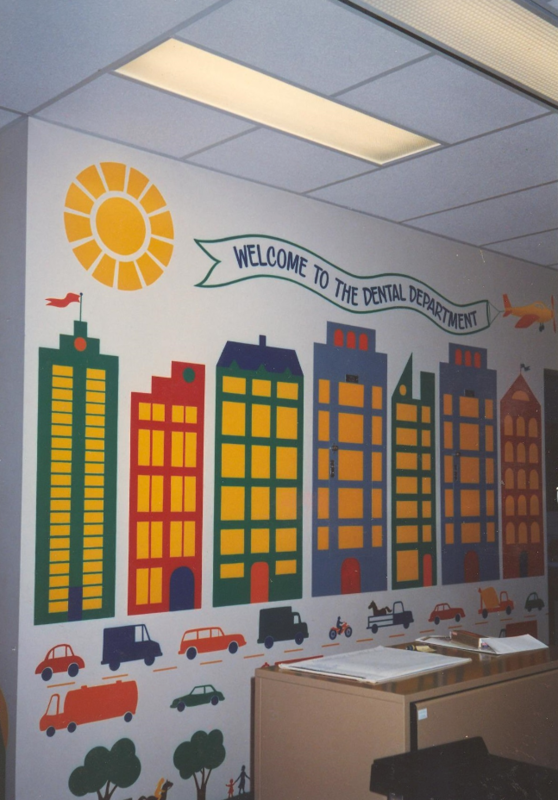 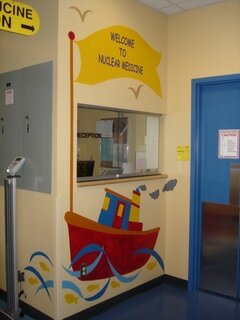 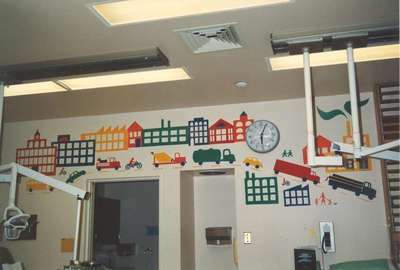 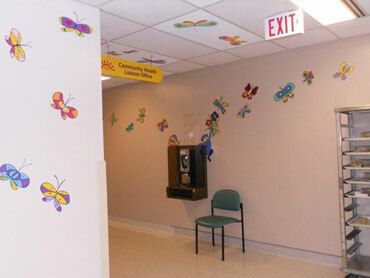 Right: A collection of murals designed and painted by Eileen throughout various departments of the hospital. 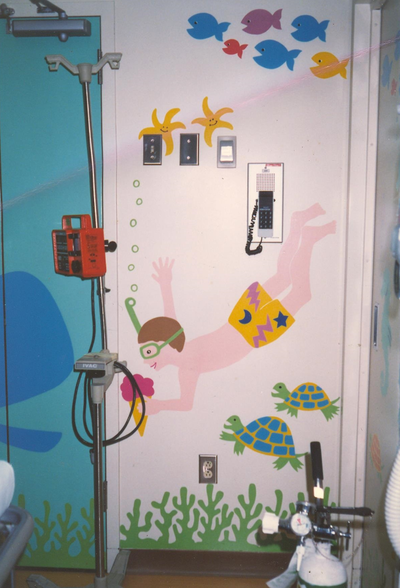 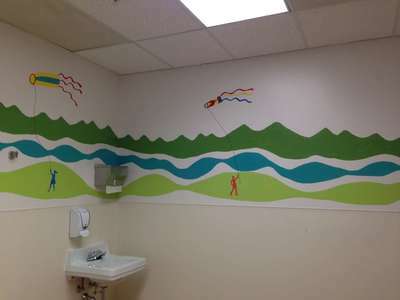 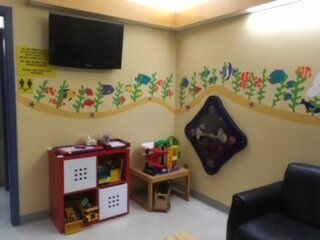 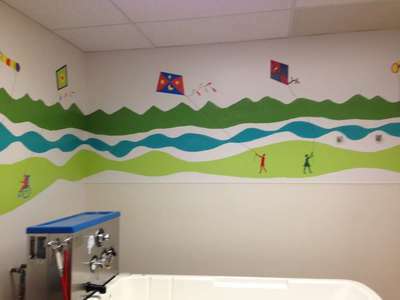 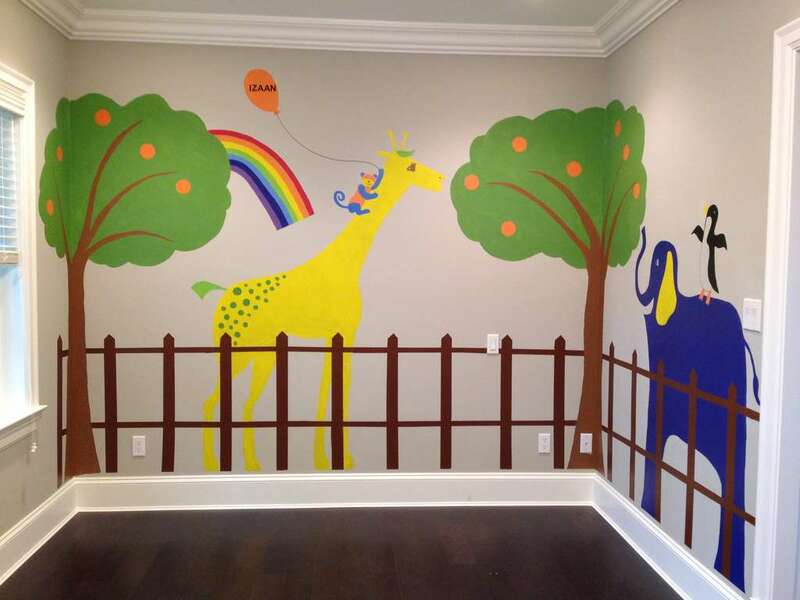 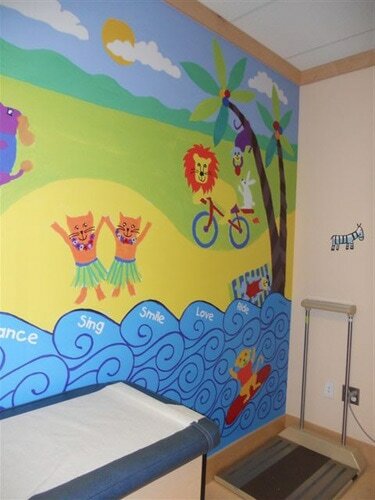 ​Right: This recent mural project at BC Children's Hospital transformed a windowless, institutional looking tub room into a brighter and friendlier place for kids to enjoy bath time. 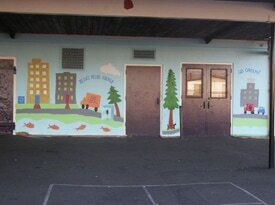 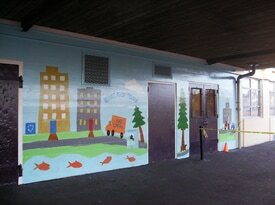 This mural was sponsored by the terrific Team Finn Foundation. 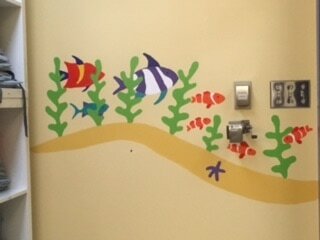 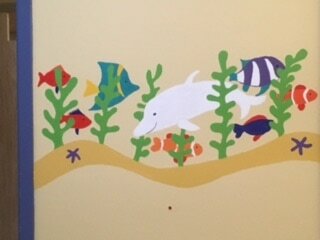 ​Left: An undersea themed mural in the MRI Waiting Room. 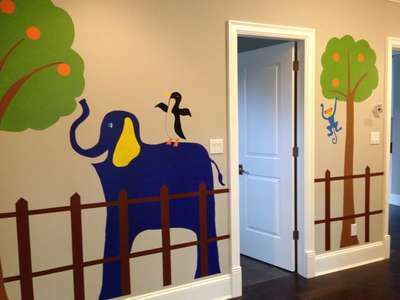 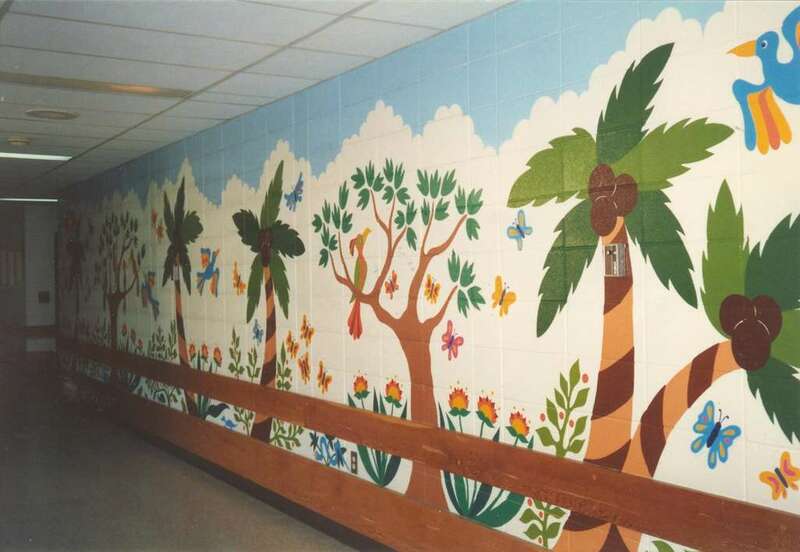 Before and after photos of a tropical hallway mural. 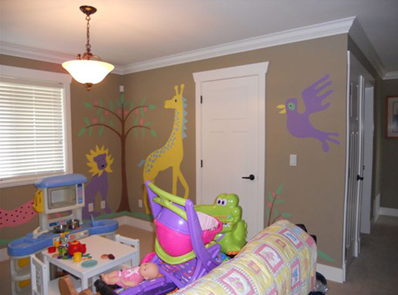 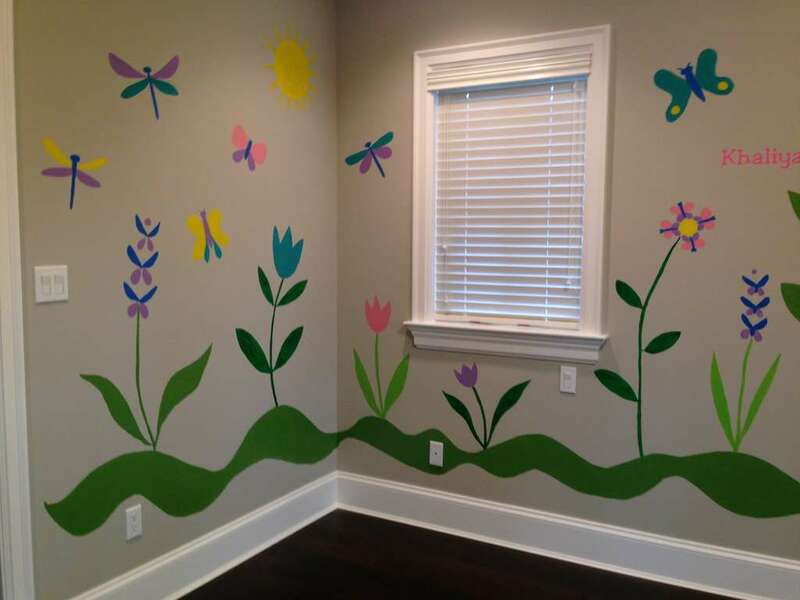 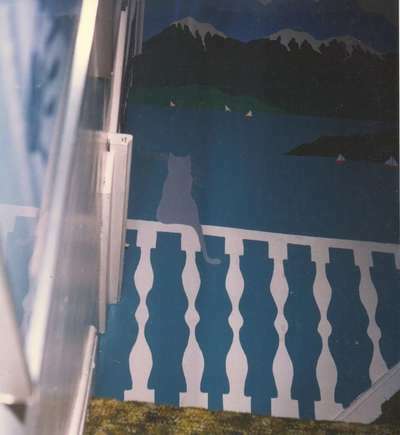 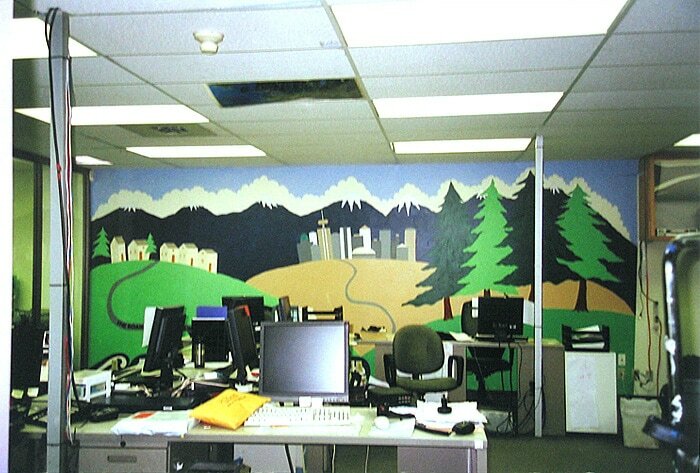 Eileen has created several murals by commission for many local businesses and companies, and even in people's homes. 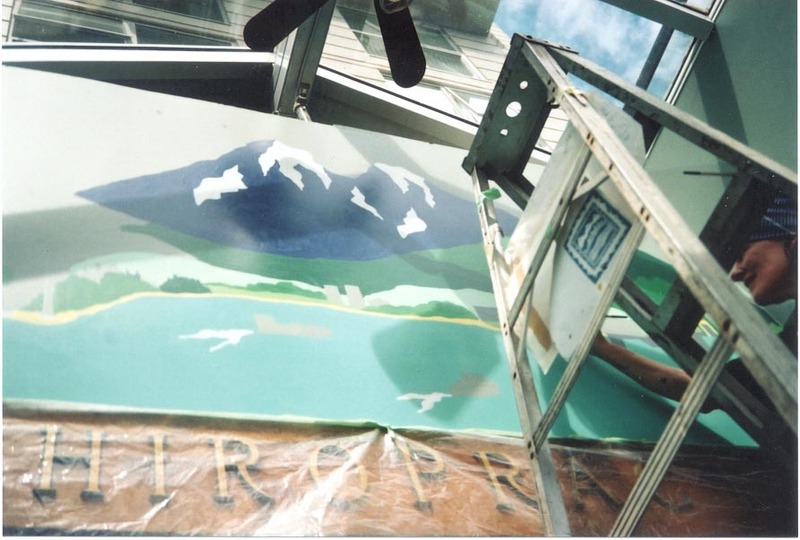 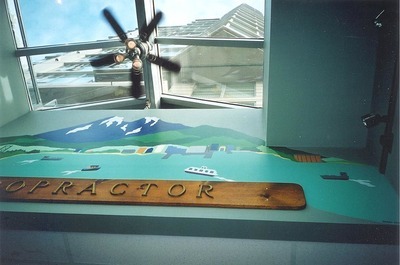 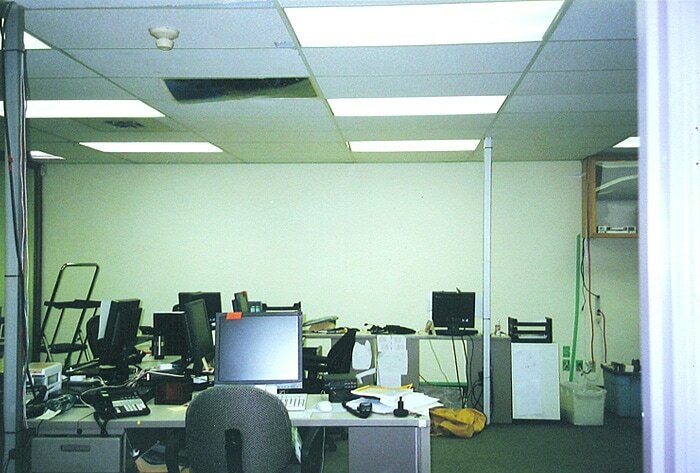 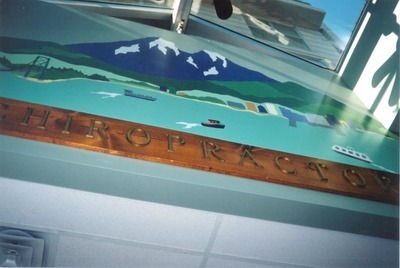 A mural commission in North Vancouver involved working from the top of a ladder in a skylight well. 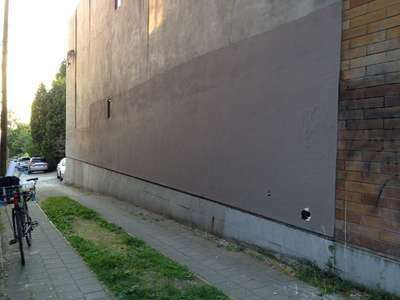 Before and after photos are shown. 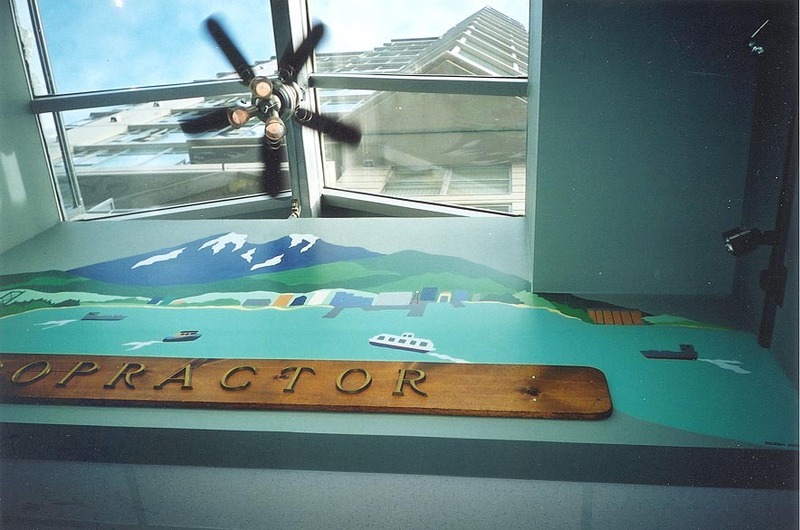 Before and after photos of a Vancouver themed mural commissioned for an office. 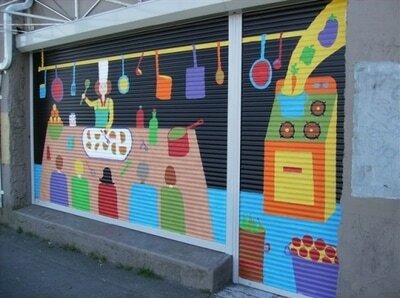 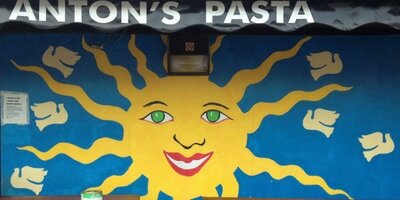 Cooking themed mural on storefront in the East Village neighbourhood of Vancouver. Mural at an Italian Restaurant in Burnaby, BC. 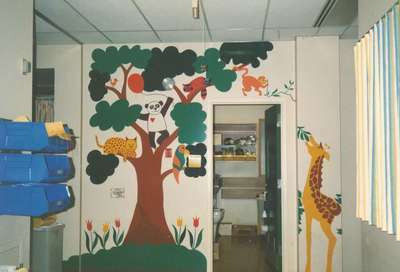 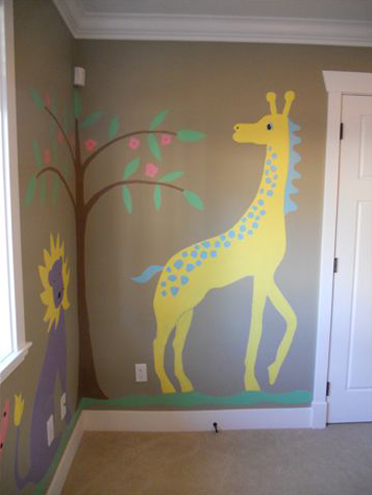 Eileen has been asked to brighten up people's homes by painting her murals in residential settings. 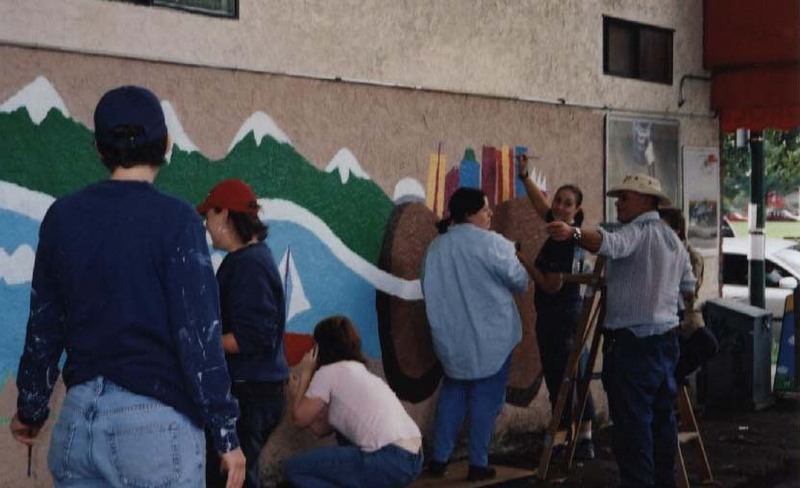 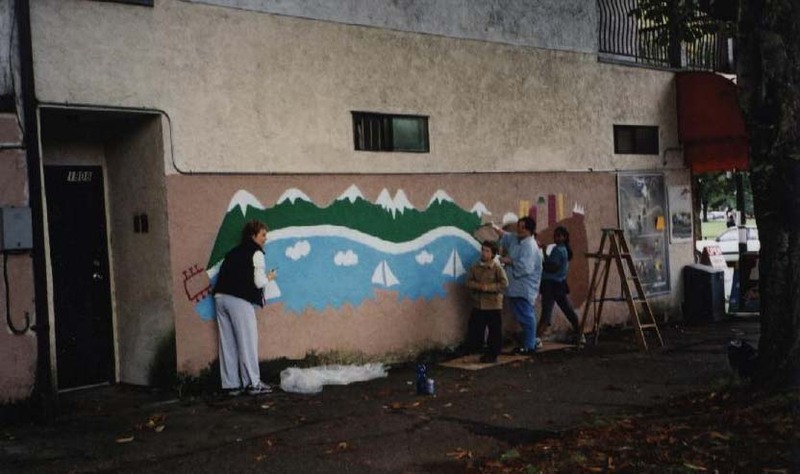 Designing and organizing community murals in connection with the Grandview-Woodland Community Policing Centre's anti-graffiti program is one of Eileen's favourite volunteer activities. 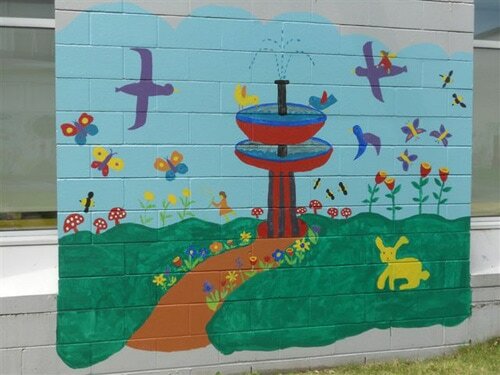 She creates simple designs that are suitable for painting by people of all ages and artistic abilities, outlining the mural elements and indicating the colours for each area. On September 29th about 50 people came out to paint a community mural at the garden at McSpadden Park on Victoria Drive. 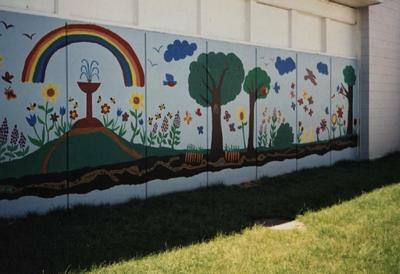 Eileen's design, created after consultation with a panel of gardeners, was approved by the Parks Board. Over 60 community volunteers of all ages participated in a giant paint-by-number mural that wraps around the fieldhouse in this well used local park on Commercial Drive. 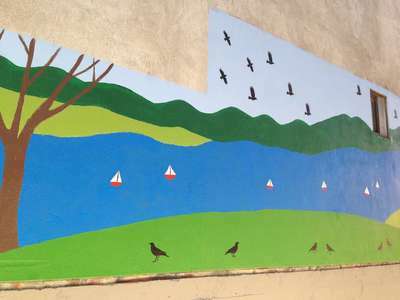 After just a week, the mural was damaged by graffiti taggers, but volunteers quickly restored it. 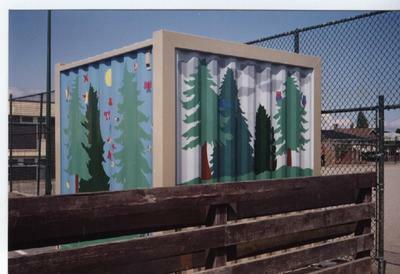 This was a "temporary art installation", as just months later the park was closed for redevelopment and renovation. 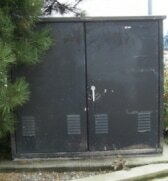 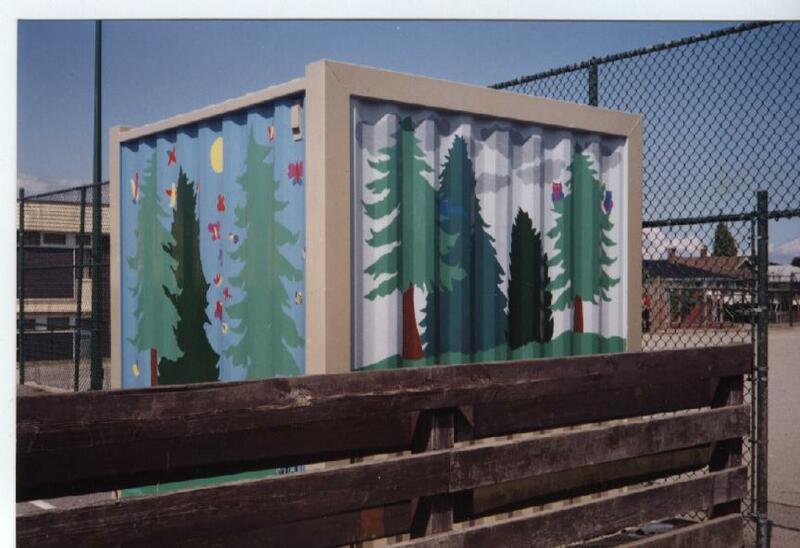 In late March 2009, Eileen used the kids' art to paint a padmount transformer. This one, at the foot of Davie Street on the seawall in Vancouver, includes the images and words from children attending the workshops she conducted at Trout Lake, Strathcona and Roundhouse Community Centres. 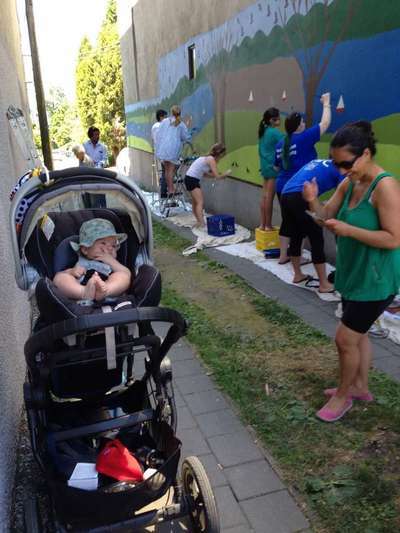 Hundreds of people passed by and commented positively on this high visibility padmount. 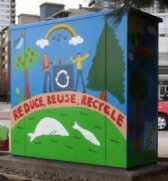 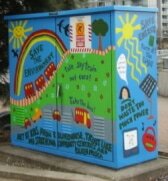 Neighbours and tourists expressed their appreciation of the children's words and pictures as well as their wish that similar electrical boxes in the city be transformed in this way. 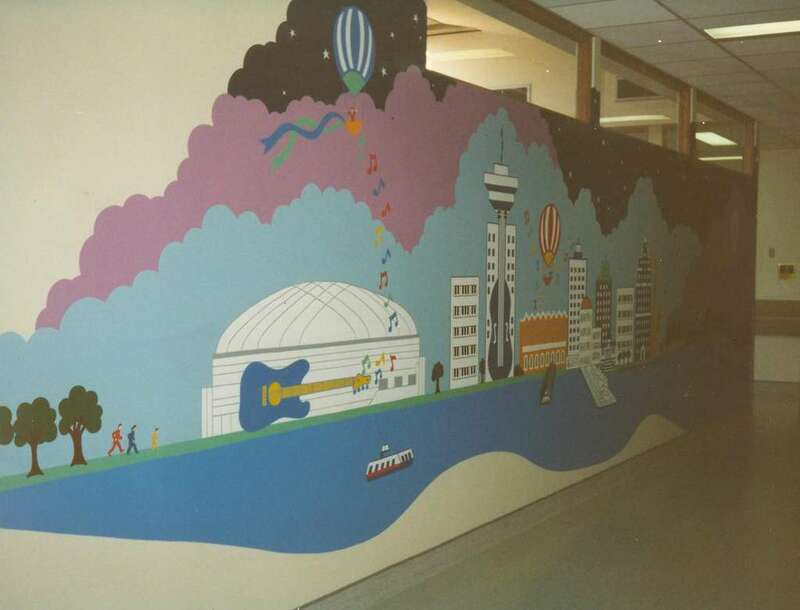 (Apologies for the poor quality photos).